I bring tidings of two quick-fire results within London Division 4; a narrow 3-5 loss to table-topping Newham, and a comprehensive 6.5-1.5 win against strugglers Metropolitan 4. First up was Newham in a matchup that gave us the chance to nestle in amongst the league leaders, but in truth with those around us having games in hand, realistic chances of promotion already alluded us. Still, the match represented a great opportunity to test ourselves against a strong side. We were ultimately edged out but nearly all of the matches went to the wire in terms of close endgames, and we could easily have won on another night. I should also reserve particular mention for Dipender. Playing in his debut season for the club, he’s performing admirably in Division 4 and has established himself as one of our most reliable players. This victory against 137-graded Dybowski Jnr representing his best ever performance in an over-the-board encounter. Next up was a match against Metropolitan’s 4th team. It’s worth reflecting on that for a moment. As we progress as a club, we’re contemplating entering a 3rd team into the London League structure, but our foes have maintained 4 for some time. Pretty impressive stuff. However, it seems that stretch is proving a bigger challenge than normal this season,as they’ve struggled to consistently put out a full team this season, with inexperienced players often taking up the lower boards. Hammersmith were in no mood to go easy on them though, as we ran out comfortable winners. The scoresheet tells its own story with a near clean sweep across the boards. Congratulations to Paul Mustafa who broke his duck for the club by scoring his first win. The first one’s always the hardest! The results leave us 5th with just our finale against Kings Head to come. We should be hopeful of getting a positive result there but whatever happens, we’ve had a great season and are certainly moving in the right direction. Lest we forget we finished 9th last season, with just 4 points to our name! Roll on Hammer!! You’re an untitled player with black against a famous GM, and appear to be in some trouble against the active white Rook and advanced d-pawn. 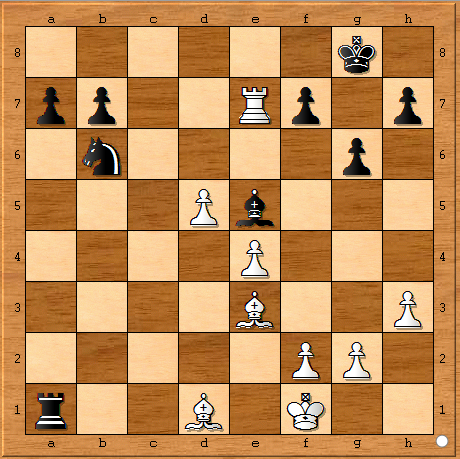 Answers in the comments please – first with the right moves takes the biscuit!